These are delicious! 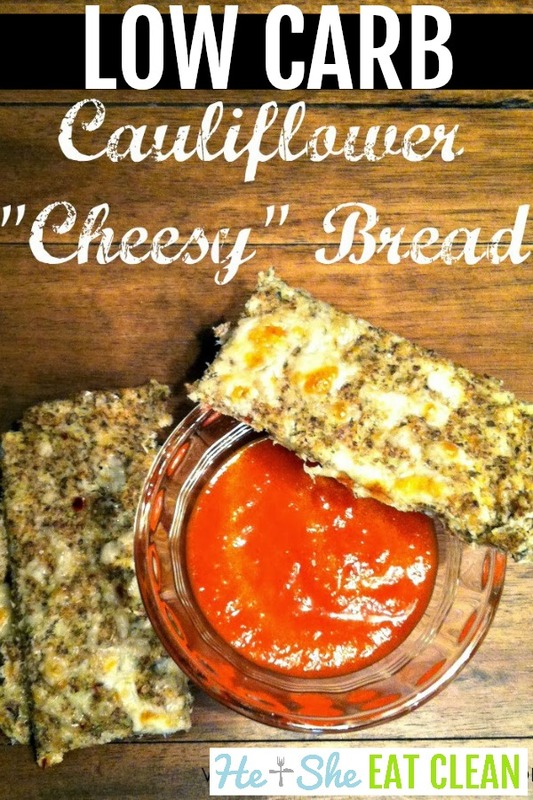 We had pizza night one night and I just came up with this Cauliflower “Cheesy” Bread recipe. It was really great to have a finger food that we could dip into a marinara sauce – a nice healthy throwback to foods we used to eat, but no guilt! Remember what you used to eat before you started to eat clean? Perhaps you ordered delivery and included some of those cheesy, almost gooey, breadsticks. Well… never fear! If you loved the Clean Cauliflower Pizza Crust that we posted a few weeks ago, you will LOVE this! The recipe is adapted from that very same one! 1 large head of cauliflower or 4 cups of cauliflower florets, stems removed. Wash and dry your cauliflower. Pat dry to remove any additional liquid. Cut the cauliflower into florets (the top part) and remove the majority of the stem. Place the cauliflower in a microwave-safe bowl, cover with plastic wrap and microwave for 4 minutes. Once your cauliflower has cooled (it will be a few minutes), place it in a tea towel and wring it out to remove excess water. Watch out – there will be a lot of water! You will want to do this over the sink! Place dough onto a piece of parchment paper sprayed with olive oil. Place dough and parchment paper into an 8″x8″ baking dish. Spread and form dough into a large, even square approximately 1/2 inch to 3/4 inch thick. Lightly sprinkle dough with remaining 1/8 cup of cheese. Bake in oven for approximately 12 minutes until cauliflower and cheese is a light golden brown. Let bread sit for approximately 3-4 minutes after removing from oven. Cut into 8 equal pieces. Enjoy with marinara sauce to dip or plain! « Eating Clean Means Consuming Calories! What would the fiber count be per srrving? Hi Tracy! Sorry, I just saw your question. It has 3.1 grams of fiber per serving.